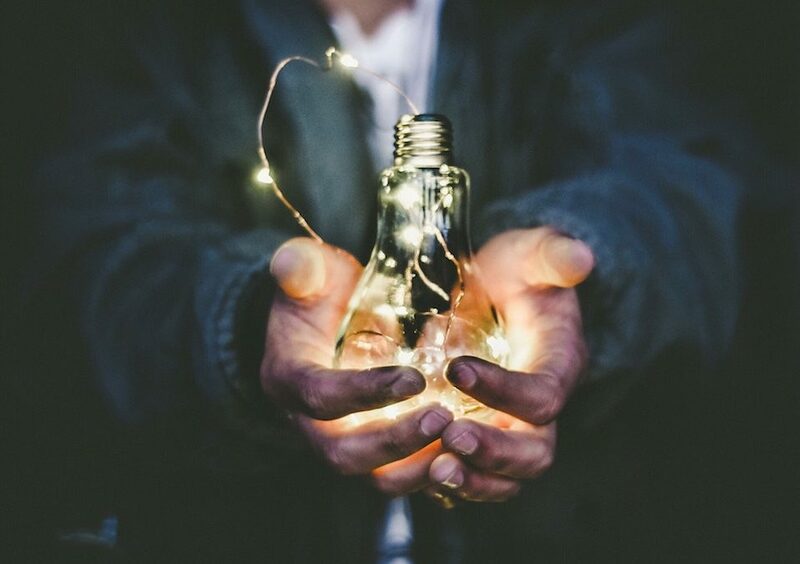 There are two common misconceptions around innovation, the first it is that innovation is only a result of some great designer, scientist or engineer, free to think outside of the box. That it is the great thinkers of the world who are entitled to the aha light bulb moments of inspiration that lead to innovation. The second, innovation is stifled by process. In business sectors where creativity is seen as paramount such as technology, software, fashion, writing and graphic design, there is often a fear that applying a process will kill creativity resulting in bland standardised products or service. The truth is process is not the enemy but innovations best friend! 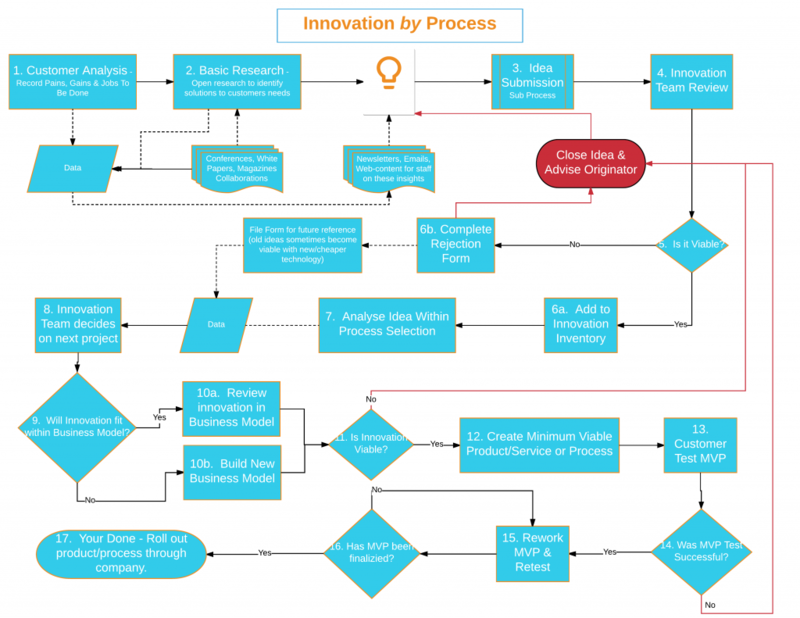 A good process demystifies innovation providing intent, resources and a framework. In doing so we turn innovation from a spark of genius into a weekly activity. An activity that can be adopted by any person or business. One of the key advantages from having instilled a process mindset into your organisation and through operating your business from a process based system is you have the ability to alter or add a new process with relative ease. Think of it as new software for your PC. If you want to change or add new software, simply download and install (and yes like software there’s bound to be a few bugs, it may take more than one attempt to install and not all software is compatible!!). Innovation is such a process. If you have a company which struggles with innovation or has no innovation system then your processes for doing so may be missing or broken. The good news is with so much information out there, there are multiple processes which you can adopt to suit your business model. I feel very passionate about innovation. Having an innovation process in your value offering is of immense benefit to a customer. It may not be on their jobs list, it may not be on any list but it should be on yours. Once you fully appreciate a target customers unique position, with what jobs to be done, pains and gains they have, you can identify areas for innovation. Creating innovation for the benefit of your customer will be rewarded with loyalty, further business and growth. I recently spoke with a Director of Jaguar Land Rover. He was presenting their system for innovation at a Manufacturing Conference. I asked a question how do suppliers support their efforts of innovation, his response was ‘its fuzzy’. It is obvious the value JLR puts on innovation. From the technology within their vehicles to the operations for manufacture. They had a very clear system of collating, reviewing and prioritising innovation suggestions and then methodically developing them within their business. However, not all suppliers adopt the same clear system. This is not to say they are not innovative but their efforts are not so well process based. JLR look to be supported by suppliers with innovation and to stand out as a preferred supplier adding process to innovation is critical. So What the Heck is Innovation? With the misconceptions around innovation I believe there is a lack of understanding of what innovation truly is and with this a lack of priority assigned to it as we do not fully appreciate its importance. All companies from the home worker to the multinational need to innovate. During the years I ran my engineering business not once did I consider it innovative. There were no innovation workshops or meetings. Yet reflecting we did have innovations from new ideas generated to solve customer problems through to the processes we used. Examples would include new tools and jigs designed to a customer product to the way we quoted to simplify the task. These were never going to create the next i-pad but with focus they could have made a greater impact to my customers and business. “Turning an idea into a solution that adds value from a customer perspective” –Nick Skillcorn. “a feasible relevant offering such as a product, service process or experience with a viable business model that is perceived as new and is adopted by customers” – Gijs Van Wulfen. Scott Anthony – “Something different that has impact”. I consider Innovation to be the partner of Improvement. Improvement looks to make changes to existing processes, methods, routines or products to increase efficiency and effectiveness. Innovation is discovering new processes, methods, routines or products to increase efficiency or effectiveness. This is to the benefit of the customer – the customer being the next person in the chain whether that be an internal customer or an external customer. Ultimately the innovation has to benefit the customer through increasing a gain, removing a pain or serving a job, e.g. making a job easier, or reducing a cost. Innovation is not measured by the size of change or value created simply by the context of where the change comes from. Much innovation comes from applying other people’s discoveries to our own product offering. I’m not Creative, so how can we Innovate? Innovation is not all about inspiration but much more perspiration. It is not a one-time offer where we need to be in the right place the right time. It’s a recipe which requires effort, research, team work and plenty of good process. 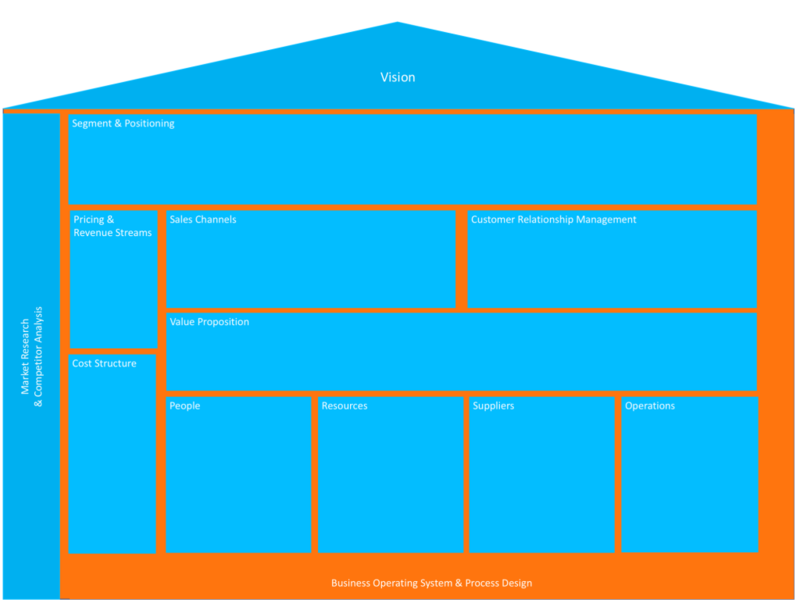 It is a set of tools and processes which apply to every industry, it is a just a matter of obtaining the perspective. 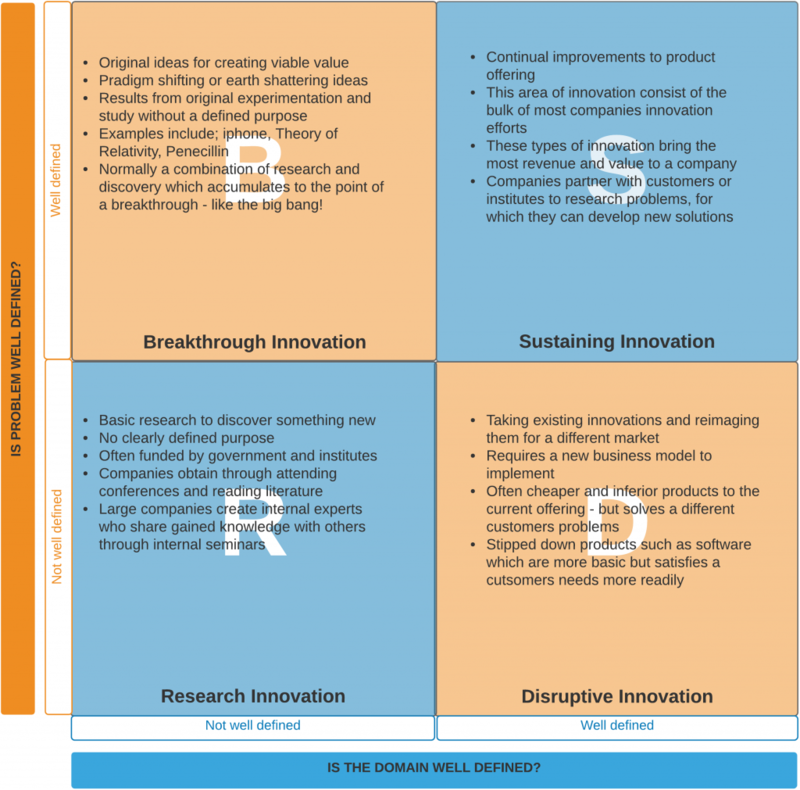 As we can see in the Innovation Matrix above there are various types of innovation. Acknowledging these four types will take the pressure off what is expected from our innovation process efforts. In the main we are not looking for the Breakthroughs but more Disruptive and Sustaining innovations. Breakthrough innovation play a massive part in the world but rarely do small companies have the capital or timeframe to invest in such open box thinking. These breakthroughs can take decades to turn into viable commercialised products or services. Instead we want to look at existing markets and products which can be disrupted, by the use of an existing product or process in a new way. A perfect example of this can be found in the book ‘Mapping Innovation’ by Greg Satell. He refers to innovation as a drawn-out process involving discovery of an insight, the engineering of a solution, and then the transformation of an industry or field. The breakthrough innovation of Penicillin the wonder drug, which went on to save countless lives is a prime example. Penicillin’s discovery was by accident, part of an experiment gone wrong by Alexander Fleming. Fleming however did not then go into mass production and sell the drug across the globe, he wrote a paper, a paper which went unnoticed for the best part of 10 years. It was only later that this paper led to an insight by a different party led by two scientist Florey and Chain who went on to turn Flemings discovery into an actual product. They refined and refined again to develop the process of producing the drug in mass quantities. Later the American government coming upon the product during WW2 ordered the drug to support the war effort saving 1000’s of lives. After the war, the drug went on sale to the public nearly 20 years after its first discovery. Innovation is a combination of efforts over a continuing cycle. It does not need a unique aha discovery but merely the ability to identify discoveries which fit a demand we have and then apply it. So where does Innovation Fit? You may be wondering where does this fit into your business model? The model we use and recommend below does not have a component called Innovation – the reason is that it applies to every part of the model. Innovation should be a policy within your business with clear governing processes to enable it to be applied to all other processes and components of the model. If you plan to grow your business with some real stretch goals over the next 5 years then innovation can be key to turning this into a reality. Innovation is not just about a better product. It is about being better period! That applies to being better at defining customer segments, how we sell to customers, how we manufacture the product or what resources we use. It’s true to say that I haven’t always felt passionate about innovation. In fact, those who worked within and were supplied by my engineering business certainly wouldn’t say so either. But perhaps they suffered the same perception and it certainly wasn’t demanded or requested from me by customers. With a focus on quality, on time delivery, and price there was no mention of innovation. Of course, innovation isn’t often something requested in principal, it’s actually more subtle than that. When competing (and believe me there are many companies offering the same service as I was), to stand out, stay ahead and remain competitive actually needed innovation. To ensure continuity of work we need to offer customers a more unique reason to stay with us. By innovating the why, how, and what of our business we could offer additional unique value to support customers and retain loyalty. To not innovate was to stay still, to compete on price alone. Ultimately many subcontract companies competing on price suffer from low margins and end up in a downward spiral. Innovation like all parts of your business needs resources of energy, time and money. We should also invest in training and the time to formalise a process for innovation and include it within our business model. Processes do not have to be procedural driven, or in other words prescriptive, do this then do that! These sorts of processes are best for standardisation especially when cost and quality is critical i.e. how to add an invoice to a ledger, or setting up a machine for a repeating job. A process can be a framework, a guide which pulls together the best methods for innovation, it steers and defines and most importantly sets boundaries. Time – the most critical resource in any company. Until the invention of the time machine, time is relative to the moment. In order to have time to be innovative we must create it. Therefore, all the other stuff we do needs to be controlled as not to effect it. To do so we must apply processes to our time management, delegation and prioritisation of tasks, to free sufficient amounts of it to fund innovation. Focus – In order to be innovative, we often need an environment to do so. Freedom from distraction and time to brainstorm. Whether that be a dedicated room free of distractions such as emails, mobiles and other people, or time away. It has often been written or stated that the best ideas come whilst out for a walk, or over a brew with colleagues from different companies. I personally often get new ideas during seminars both when I present and attend. Hearing of other people’s breakthrough or pains often leads me to connect the dots. How an idea could help my customers, or how a pain could be solved by applying a tool which I had never thought of before. Prioritise – Building a better mouse trap is brilliant if you are in the market of pest control, if not then I suggest you look at what is important to your market segment instead. List your customers pains, gains and jobs to be done, then rank each one in importance and start from the top! Definition & Visibility – with a clear and defined innovation system, everyone is clear how, when, where and who is responsible for innovation. Everyone can fulfil their part in supporting a company find new ways to solve customers problems. I love all things process but innovation is right up there with my favourites. Too few companies invest time in innovation as a result of not having a clear process. I hope this article helps those who desire to be better to add or shake up their current innovation processes. We can’t all be the next Steve Jobs but we can improve value for our customers for small innovation at a time.